Being industry leader, we present an extensive range of lug caps also known as Twist Off Lug Cap, which is made of supreme quality steel sheet. These are widely demanded in different food industries such as jam, kitchen paste, and pickle and other products of diary industry. We offer these caps in various sizes such as 58 mm lug cap for 375 ml bottle and 43 mm lug cap for i oz bottle for both domestic and international market. Packaging Details: packed in poly bags, and out side covered with corrugated box. 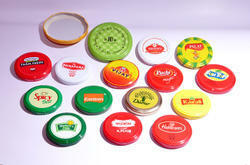 Looking for Lug Caps Manufacturer India ?